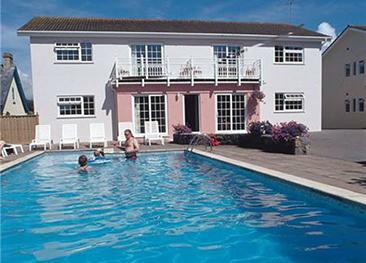 Vazon Bay apartments are attractively built around the outdoor swimming pool, offering an inviting and convivial family holiday set up. Toddlers will enjoy their dedicated pool area and teenagers will love the indoor pool room. With shops, beaches and restaurants nearby, this is a great place to spend time relaxing and discovering the island. Arrivals are permitted any days of the week and there is no minimum stay requirement. There are 10 standard two-bedroom apartments; five Deluxe two-bedroom apartments, two Luxury Gold Award four-star two-bedroom bungalows, and three Luxury Gold Award three-bedroom bungalows. All apartments and bungalows are equipped with satellite TV, free WiFi, bedroom and bathroom linen (bring your own beach towels), and a well equipped open plan kitchen with dining/lounge area. Heating and electricity are inclusive. All 10 units open onto the swimming pool. Deluxe apartments are on the first floor and feature a family bathroom as well as a shower room. Luxury Bungalows offer large bay windows opening onto a private lawn and spa pool. 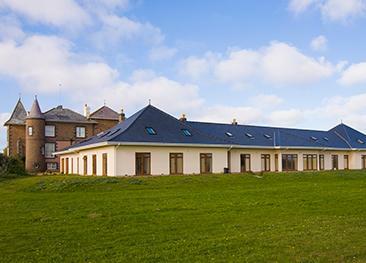 All bedrooms are en-suite and feature a 17" TV, DVD player. Vazon Bay apartments are purpose built with ample entertainment on-site, least of all the splendid outdoor heated swimming pool. The beach at Vazon Bay is renowned for its swimming and surfing and can be reached within a few minutes walk. The west coast of Guernsey is an idyllic place to spend a few days with the family, unwinding on the beach or going exploring some of Guernsey's country lanes. Many restaurants are peppered along the coast. The bungalows are all wheelchair friendly. Dogs are accepted on a request basis at a charge of £80.00 per week. 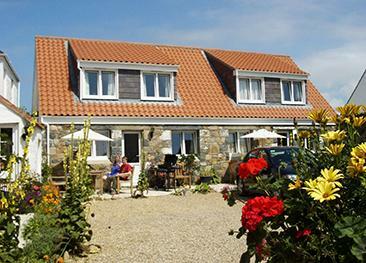 Vazon Bay Apartments are a super place to stay. The apartments are well equipped and clean. The owner, Richard, was keen to see everyone enjoying their holiday and made a point of speaking to all his guests regularly. Having the pool was a real bonus, as was the hot tub - the children loved it. Lovely, well equipped apartment, The kids were delighted with the pool and swam every morning and eveing, despite the weather being less than good. Great location, friendly proprietor. I think it helps that the proprietor is on the premises - it adds the personal touch.